Interstate 865 is a nearly five mile interstate that connects Interstate 465 with Interstate 65 to the north. In a way, the interstate is simply a long set of ramps between the two highways. The interstate was originally numbered Interstate 465 and called "the Dogleg." However, the awkward situation of having Interstate 465 intersect itself in three spots prompted INDOT to renumber the highway in May 2002 to Interstate 865. The interstate has no interchanges except at its ends, and if local opposition holds true, that is unlikely to change. A U.S. 52 marker accompanies the eastbound shield posted for Interstate 865 between Interstate 65 (Exit 129) and Fishback Creek. U.S. 52 continues in hidden fashion along Interstate 465 inner to Exit 47. Photo taken 07/31/09. Second photo taken 11/05/09. 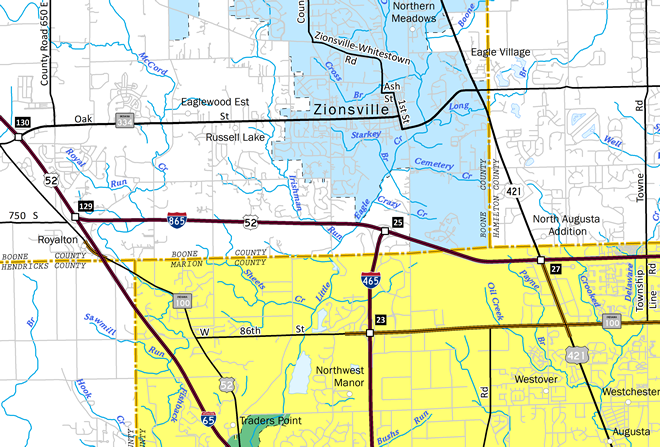 One mile west of the junction with Interstate 465 along Interstate 865 & U.S. 52 east near Zionsville. A directional interchange joins the two freeways. Photo taken 11/05/09. Spanning Irishman Run, eastbound drivers are advised of the U.S. 52 connection with Interstate 465 east (inner loop). The US Route follows the Indianapolis Beltway as an unsigned route between Exits 25 and 47 (Brookville Road). Photo taken 11/05/09. One quarter mile west of the southbound off-ramp to Interstate 465 along Interstate 865 & U.S. 52 east at the Ford Road overpass. Interstate 865 meets the Beltway as it turns southward from the Zionsville area to Park 100, Speedway and Indianapolis International Airport. Photo taken 11/05/09. Interstate 865 & U.S. 52 eastbound default onto Interstate 465 east at the crossing of Eagle Creek. The beltway skirts the Marion County line eastward to College Park, Carmel and Castleton. Interstate 465 south meets its parent in five miles by Eagle Creek Park. Photo taken 11/05/09. A directional interchange joins Interstate 865 with Interstate 465 at the northwest corner of the Indianapolis Beltway. U.S. 52 departs Interstate 465 west (outer loop) for a five-mile overlap with Interstate 865 to Interstate 65 north. Photo taken 10/16/04. There are no interchanges along Interstate 865 itself, instead drivers simply shuttle between its ends. A westbound reassurance marker, replaced between 2004 and 2009, lies ahead of the Ford Road overpass. Photo taken 10/16/04. Second photo taken 11/05/09. Crossing Fishback Creek, Interstate 865 & U.S. 52 west near the wye interchange with Interstate 65 north. Photo taken 11/05/09. The left lane ends as U.S. 52 prepares to merge onto Interstate 65 north ahead of Indiana 334 (Exit 130). U.S. 52 follows the northbound freeway to Lebanon (Exit 141). Photo taken 10/16/04.